The plywood kits do not include the plans or the epoxy/glass! 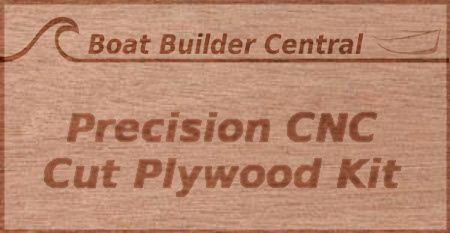 The precut plywood kit includes all the plywood needed to build the boat as designed. If the boat plans show options, the CNC kit will be based on the most commonly built version. In case of doubt; please consult us. The kit is cut on a computer controlled router system (CNC numeric machining) for extremely accurate and precise panel creation. All parts are cut from BS 1088 Okoume plywood to the designer's specifications. Each panel is cut leaving tabs between the piece and the waste plywood. This allows for safer shipping leaving small tabs for the customer to cut out, much like taking apart the pieces of models when we were kids. Most kits include features not shown on the plans. If applicable, we supply temporary/throwaway MDF molds - a huge time saver. In many cases, we cut notches in stringers and frames/bulkheads for easy assembly without measuring. In almost all kits, we pre-drill stitching holes along the chine and keel. Everything fits the first time. A very short construction time. The satisfaction of looking at a real boat hull in your shop after only one or two days. No woodworking experience needed: ideal for 1st time boat builders. Fewer tools and less space required for assembly. As each kit is cut to order, shipping time will vary from 2 to 3 weeks depending on your location and trucking time. The kit is packaged as a pallet of full plywood sheets (see the tabs system described above): be ready to help to unload the truck. To receive a quote for shipping outside the lower 48 states, please click on checkout and select payment by phone (no payment information is required). This is not an order but a request for a quote. We will respond with a shipping quote and ask for approval before processing payment. *free shipping to a commercial address or to a freight terminal in your area where you can pick up. Residential delivery is available for an additional $150 Please indicate a business name/address or "freight terminal" at check out for commercial rate.